Not just in innovation, but in continuous innovation. Can operate from any Smartphone. Download the app & get started. Uses both GPS and network of an android phone. Own the app free with minimum data usage. Peace of Mind Our school bus locator app is artificial intelligence integrated school bus tracker app security system of real-time GPS tracking for school buses and its users mean peace of mind for parents and ensure that children arrive at school and home safely every day with high end data security of both parent and student. Safety of the child Bus can be tracked to know when your child will reach school from home and vice versa. Also the exposure to inclement weather and other dangers the child can be exposed to during waiting for the bus is fairy reduced. Track my school bus concept give more confidence to your children. 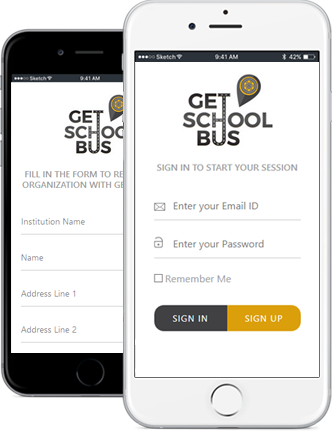 Service School bus GPS tracking system could extent their service both in terms of safety for the children as well as being latest in service and convenience for the parents. Route optimization In our school bus monitoring system, school bus management system console give freedom for managers to optimize bus route to reduce turnaround time, fuel consumption and expenses.